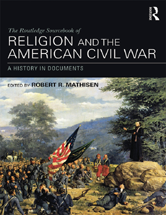 With chapters organized both chronologically and thematically, and highlighting the experiences of soldiers, women, African Americans, chaplains, clergy, and civilians, this sourcebook provides a rich array of resources for scholars and students that highlights how religion was woven throughout the events of the war. “A National Hymn”—Park Benjamin Sr.
“God Save the Grand Old Stars and Stripes!”—Mrs. S. G. Knight & Dr. John L. Sullivan Jr.